An unusual native perennial plant, with light green bell shaped flowers, with purple edges, that hang from a thick upright stem that stands out from the dark evergreen foliage at the base. 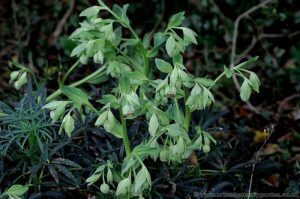 Stinking Hellebore (Helleborus foetidus) may be found growing naturally in the wild, in shaded areas of woodland in Central and Eastern England preferring the rich limestone soils. Often a plant gets a name from the colour or scent its flowers, the “Stinking Hellebore” gets its unfair name from the unpleasant smell given off by the lower leaves when damaged or crushed. This said, from my own experience of these plants growing in my garden I haven’t noticed any real unpleasant odours! 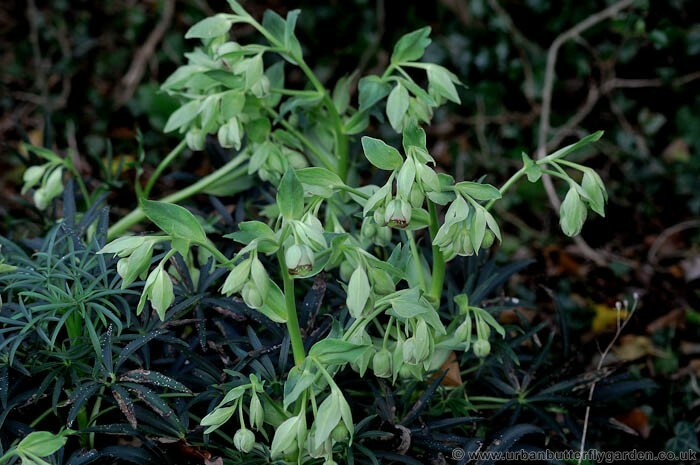 The unusual green flowers however which appear January – May, give off a particularly pleasant sweet scent. Early insects like bumble bees find them most attractive and will often search them out even on chilly spring days. 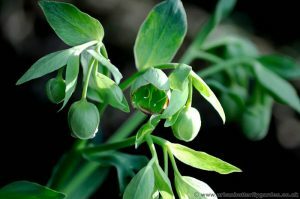 Stinking Hellebore (Helleborus foetidus) plant growing locally woodland. The popularity of the Hellebore in the garden has lead to many cultivated varieties of these hardy early flowering perennials, in an amazing array of colours. 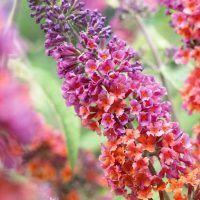 More suited to these varied conditions, they would not look out of place on the patio or in any cottage or woodland garden. Hellebore ‘Black Swan’ (Helleborus × hybridus), with dark velvety petals. Hellebore ‘Gold Star’, with cup shaped, pale gold blooms. Hellebore ‘Pink Spotted’, with pink flecked blooms. Light: Shade – Partial Shade. Soil type: Well drained, alkaline. 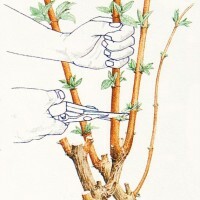 Propagation: Grow from newly ripened seed.